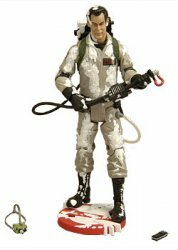 The inaugural Club Ecto-1 subscribers-only 6-inch figure honors Ray Stantz, the man the citizens of New York can thank for making a marshmallowy mess of their fine city. Very hard to find. No longer available for purchase elsewhere. Ray is covered with the remnants of his nemesis, all the way down to the "no Ghost" platform he stands upon. Along with a glow-in-the-dark proton stream, he features an exclusive Ghostbusters walkie-talkie and "ecto goggles." 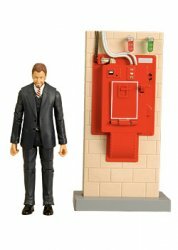 This fully articulated, film-accurate 6-inch figure is sure to please the diehard Ghostbusters fan. Collectors Note: Brand-new and factory sealed. Plastic-packaged figure comes in white box with black Ghostbusters logo and "Marshmallow Mess Ray Stantz" on the front. Intended for the adult collector.